The following article, which I present in its entirety, should be required reading for all who cling to the obscenity of horseracing-as-sport. He was the horse no one had ever heard of. The undistinguished battler who never captured the nation’s heart. Indeed, he failed to capture anyone’s, except perhaps his owners, until they too fell out of love with him; their dreams of riches and reflected glory dashed. Unlike Kingston Town, Black Caviar or Red Cadeaux, Poor Ned occupies no special place in racing history. He never even reached the track: for all the frenzied efforts of his trainers, no whisper in Poor Ned’s ear or whip on his hindquarters could spur him to go any bloody faster. No one sent cards or flowers wishing him luck. No ashes were to be scattered at Flemington, where he never appeared. No one ever cheered him down a home straight anywhere. He never grew to be an old warrior. He was just another two-year-old nag who wasn’t good enough. He wasn’t handsome enough for dressage and he couldn’t jump to save himself. He was too nervous for kids to ride on. Even professional jockeys found him hard work. The best that could be said about Poor Ned is that no one other than his owners ever lost money on him. He was, in all respects, a disappointment. So his owners regretfully made the decision that, all agreed, was in their best interests. After all, he was costing them around a hundred bucks a day. And Poor Ned was high maintenance. He couldn’t cope with the stalls and he wasn’t much more docile in the stables. He never gave anyone any joy. He competed with no distinction; in fact he was so lacking in distinction that he never competed at all. He was fragile and cranky, and no one will miss him, because no one other than his owners and handlers knew he ever existed. He served no useful purpose whatsoever. No one ever turned out in their finest for him. No jewellery was flashed; no top hats or tails were worn; no ostentation of any kind was ever required. At least, being no peacock, he never had to put himself on display either. No one ever cooed their admiration at his perfect physique before he took to the track. So to the knackery he went, unmourned. They led him to the kill-box and humanely euthanised him with a bullet to the head. Red Cadeaux was the third horse in two years to die after the Melbourne Cup. Poor Ned was just another horse that never made it. There’s more where Poor Ned came from, though. About 15,000 thoroughbred foals are bred each year in this country. Some of them are bought for millions; when they fail, they might fetch a couple of hundred in the saleyards. But gambling is big business. Sometimes you have to cut your losses. They ground Poor Ned up for dog food, but no one ever got attached enough to him to care. No one outside of his connections knew his name, and nobody in his industry’s governing body recorded his fate. He wasn’t even a statistic, because no official statistics on horse wastage are recorded. Apparently there are roughly 10,000 Poor Neds a year. Horses that simply didn’t have the necessary fast-twitch fibres, lacked the temperament for racing, or just broke down injured. Or they were just too much trouble. 10,000 horses that the nation never stopped for. For further reading, please see my 2013 post “From Wastage to Dinner Plate”. This read is a horror story. A true-life horror story. If it still doesn’t GRAB your heart and mind, replace Ned’s name in this true account with your own horse’s name. Imagine him/her in that photo. Make it real…because it was real for Ned. And for thousands of our nation’s own racehorses. This guy is a Puke!!! He should point that gun in the opposite direction and shoot himself and not this poor horse!!! This should be illegal!!! People like this deserve to meet a brutal ending…hope he rots in hell!! I thought the article was well written but object to the title of “Dog Meat” most horses in North America are used for human consumption. Not sure what country this article is from but in Canada over 80 THOUSAND or MORE horses are slaughtered every year to be sent overseas for human consumption. People need to understand that horses given drugs BANNED from entering the human food chain are allowed to be slaughtered and consumed by people NOT dogs and the CFIA ( Canadian Food Inspection Agency) turns a blind eye. The horse in question was from Australia, a nation that does use horsemeat for dog food. Theresa, ex-racehorses are also slaughtered in Australia for human consumption. There are two abattoirs, one is Peterborough in South Australia and the other is Caboolture in Queensland (my daughter rescued a healthy ex-racehorse from there) which are multi million dollar businesses in the production of horse meat for human consumption to be exported overseas. Thank You Patrick for posting this story. in the US, the numbers of race horses being sent to slaughter are much higher from what i have been told. aprox. 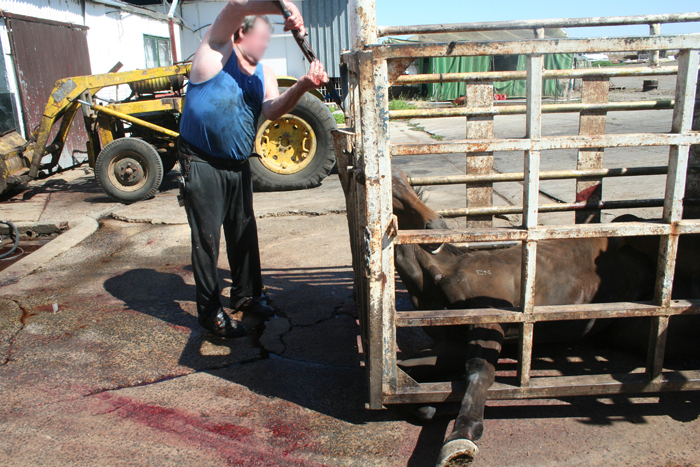 150,000 horses are sent to be brutally murdered every year in Canada and the US. I have been told that aprox. 20% are race horses. i do not know exact numbers. For those who have not witnessed the horrific abuse. it is a horror show that I first saw 2 years ago and is still fresh in my mind. Every race horse owner that puts their horses into a claiming race, runs the risk of their horse ending up in a slaughter house. It is sheer EVIL. People that allow this are creating very serious bad karma. EVIL. Pure evil. Greed. Corruption. the list of adjectives to describe people that do this and allow this is extensive. There is no such thing as “humane euthanasia.” A horse moves its head swiftly and may take many shots. Even then it will thrash on the ground for minutes. If you support horse racing in any way, you support these cruel deaths. It’s another fun sport where animals are injured, abused and murdered. The “fun” seekers turn a blind eye to the suffering they know exists and avoid any involvement with their consciences. It’s all fun and games to watch these beautiful animals run for their lives! Get dressed up, grab some cash, and bet on which of them might die today! The reason I don’t sell my quarter horses, paints, morgans, minis or my rocky mountain horses, even when they are no use to me.